I feel that Beau's may love to collaborate more than just about any brewery in Canada. They collaborate not only with breweries, but also with musicians and actors. Their Tom Green Stout is regarded (by myself) as being one of the top milk stouts in Canada, and they most recently worked on a collaboration beer with the Rheostatics for Beau's Oktoberfest. 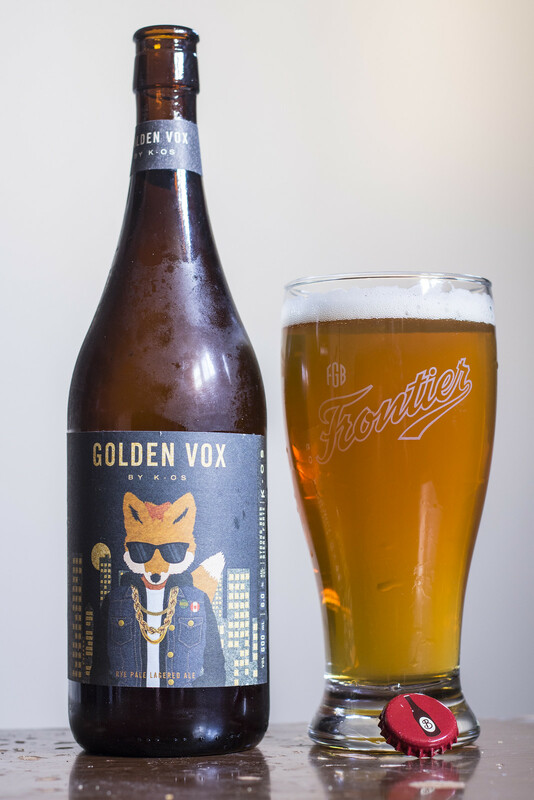 Appearance: Golden Vox has a mostly clear, crisp golden body with a bit of a caramel hue to it. The beer starts off with a good amount of off-white head on top that quickly diminishes to a very thin layer. Good amount of carbonation taking place in the beer. Aroma: There's a fairly light rye presence that gives off that rich, lightly roasted aroma that I can only describe as well.. rye. The beer has notes reminiscent of their Lug Tread Lagered Ale - crisp and grainy barley malt, a bit of sweetness, light grassy hops, and a hint of lemon. Notes of crackers and a light woodiness also pop up in this beer. Taste: Seeing that this is using rye malt, this is giving off more of a bitter flavour than Lug Tread. There's notes of rye (duh), saltine crackers, a more noticeable note of oak than in the aroma which gives off a hint of whisky, a bit of caramel and the woodiness of the oak. There's grassy hops, a good amount of lemony citrus kicking in, a light hint of peppery spiciness, and a light rye/hop bitter aftertaste that lingers only momentarily. Overall Thoughts: One of the better lagered ales I've had in the last while - I like the presence of the rye which gives it a bit of a bitter presence to it. It's fairly easy to drink and has subtle notes of oak popping up here and there, which I like.